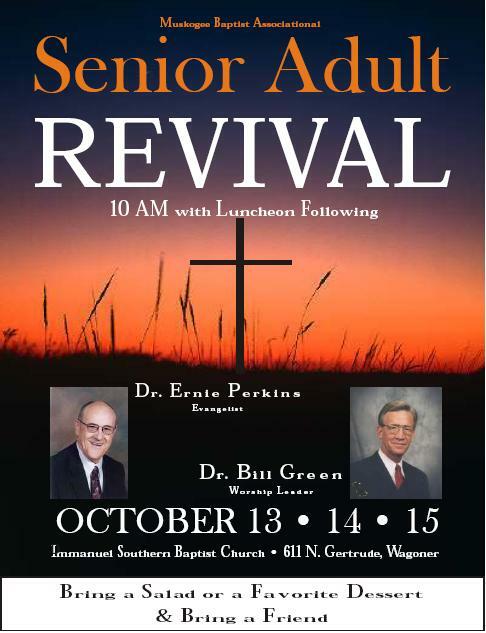 Everyone is invited to the Muskogee Bapitst Association’s Senior Adult Revival, October 13-15. It starts at 10 am each day with lunch following. You are requested to bring a salad, a side dish, or a dessert. Invite your friends! This entry was posted on September 23, 2008 at 9:49 am	and is filed under Fellowship, Muskogee Baptist, Revival. Tagged: Bill Green, Ernie Perkins, Muskogee Baptist, Revival, Senior Adult, Senior Adult Revival. You can follow any responses to this entry through the RSS 2.0 feed. You can leave a response, or trackback from your own site.